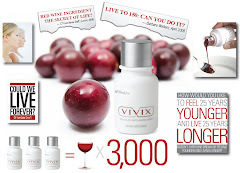 The response to Vivix, Shaklee’s amazing new Cellular Anti-Aging Tonic made from resveratrol, has been amazing. Over $1 million dollars worth of Vivix is being sold each week and the demand is only increasing. Dr. David Sinclair, the leading scientific researcher on anti-aging in the world he talks about the Science of Anti-Aging. Check out what folks are saying about Vivix! STROKE RECOVERY: A massive stroke 3 1/2 years ago (doctors attribute to my irregular heartbeat-- I believe it was stress) attacked my right brain (& basil ganglia) leaving my left side totally unavailable and the right brain majorly stressed, reactive, & depressed. Never totally giving up, taking handfuls of Shaklee supplements, exercising, listening to motivational cd's, getting Brain Gym balances, regular chiropractic care, etc., my progress was evident to those who knew me, including my doctors. But what they didn't see was the exhaustion and struggle it took. Then along came Vivix, August 15, less than 6 weeks ago. First I thought it was probably the placebo effect, but today I can tell you a few of the things I KNOW have changed. BALANCE--so bad in the past that one of the many falls landed me under my rolling car, crushing my right leg, though not the bone. My balance has improved so much I now climb stairs, carrying something in EACH hand, and not even holding onto the rail. ENERGY--so different now I can do 30 minutes on the treadmill, noting my improved heart rate & instead of having to take a nap, I take off to do errands, deliver Shaklee and attend a Spanish Class – in which I am much more focused. FOCUS-- Always ADD and hypoglycemic, worse since numerous car wrecks in the 80's & the more recent stroke. I am experiencing now more blood sugar balance and longer attention spans--just finished reading a whole book in a couple of days and, most assuredly,I am making an A in the Spanish class (where my classmates & teacher are @ 1/3 my age).So I would say my mental acuity and memory are enhanced as well! VIVIX vs. High Blood Pressure I have high blood pressure that is controlled by a diuretic and beta blocker combination medication. Usually even with medication my systolic ranges between 129-138 and my diastolic between 75-83 and my pulse would range anywhere from 80-91 (rarely dropping below 80).